The path to perfection for aspiring Kickers and Punters. We reveal the best football kicking book & video available. Improve your game and dominate this season. This past father’s day weekend we had quite possibly our best youth kicking camp ever. Texas football is king and these youth kickers and punters did not disappoint. We hold an annual summer kicking camp in Austin, TX (actually in Cedar Park – North Austin to be exact) the second weekend of June during Father’s Day. We have a 2-Day camp for HS students and a one-day youth mini camp for beginner/younger kickers and punters ages 9-12. Kicking World youth kicking camps are focused on fun, learning, and friendly contests that teach students ages 9-12 the fundamentals & technique of placekicking, kickoffs and punting. We normally don’t get too involved in the competition aspect of a youth kicking camp, but the talent at this Austin kicking camp was so big that we’d like to remark on some of the highlights! Repeat camper and private lesson student – Roberto Diaz Jr., from Carrollton, TX lit up the kickoff competition with a 34 and 40 yard kickoff which averages out to 37 yards! For a 10 year old kicker that is unheard of! Roberto is one awesome kicker and at the rate he’s going there’s no telling how far he take his football kicking ability! Another 10 year old, Ben Scott from Austin, TX put together a 36 yard punting average to win the punting competition! In the field goal competition, we had several big hitters, but one stood out from the crowd when the pressure was on. From Austin TX, 11 year old Nathan French hit 4 consecutive field goals of 15, 20, 25 and 30 before missing a 35 but in the final kick to determine the winner at 40 yards, he made it! Nathan’s 40 yard field goal sets a new Kicking World record for the longest field goal in a youth kicking camp field goal competition; congratulations Nathan! Another good kicker, 11 year old Tate Balla, from Round Rock, TX came in 2nd in the field goal competition by making field goals back to 30 yards. The youth kicking camp was a major success and not only did all of the 10 students in attendance learn a ton, they had fun! We look forward to coming back to Austin, TX again and seeing even more youth kickers from Austin area Pop Warner, Central Texas Pop Warner and all the youth football leagues in Central Texas! Enjoy all the photos from this camp on our Kicking World Facebook Page. 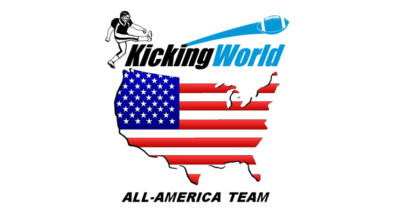 We hope to see ya’ll at a Kicking World youth kicking camp soon! For anyone or anything to remain successful, they need to innovate and constantly improve. Sure, there are processes that are proven and just work OK, but to really accelerate and get results there is always a ‘better way’ to do things and constant improvement and commitment to perfection ensures optimal results. I’ve spent the last 10 years crafting and refining the art of kicking and punting and I’m confident my DVD, Book and eBook are the best instructional tools available today for kickers, punters, parents and coaches who want to see results quickly, improve and ultimately be the best they can be. There have only been a few resources for kickers, punters and coaches in way of books and videos in the last 20 years, and quite frankly many of them are ancient and outdated. In my series of books and DVDs I take you on a journey with me as your private coach that closely mimics the experience of a private lesson or camp. My instruction is not only excellent for the actual kickers and punters, but also perfect for Special Teams Coordinators, Head Football Coaches and even parents wanting to understand the fundamentals of kicking and punting. All levels and ages will benefit: including Professional, College, High School and even Youth. If you have been at a standstill with your kicking, are a beginner looking to learn the ropes, or are perhaps an experienced veteran specialist who needs that edge to get you to the next level; I know my Complete Guide to Kicking & Punting series will answer your questions and help you achieve the results you are capable of.